Daniel Ksepka, PhD, is the Curator of Science at the Bruce Museum. Ksepka earned his PhD in Earth and Environmental Sciences from Columbia University in 2007 and spent five years in residence at the American Museum of Natural History in New York, where he performed his dissertation research on the fossil record of penguins and gained broad experience in the curation and study of natural history objects including fossils, skeletal materials, skins and geological specimens. Over the next couple posts, Daniel will share information about prehistoric penguins. Learn more about penguins, their ancestors, their physiology and their biology. Visit the Aquarium! Keep reading for more about the first penguins in the fossil record. Penguins have a remarkable family tree. Today, there are 18 officially recognized species of penguin spread throughout the Southern Hemisphere. Each of these species is unique, and together they span a wide range of sizes, ecologies, and preferred environments. Yet, these spectacular birds are only the most recent branches of the extended penguin evolutionary tree. More than 50 extinct species of penguins have been discovered in the fossil record. Paleontologists have learned many secrets of ancient penguin evolution from this rich fossil record. In this series of posts, we will take a look at the march of penguins across the southern seas. It all started when dinosaurs still roamed the Earth. Ornithologists have used DNA evidence to estimate that a group of ocean-going birds split off into two lineages sometime more than 66 million years ago. One of these branches gave rise to the tube-nosed albatrosses and petrels, and the other gave rise to penguins. These estimates would place the start of the penguin lineage during the Cretaceous Period, but at this first stage they were probably still capable of both wing-propelled diving and aerial flight, much like modern puffins. So far, paleontologists have not found any fossils to illuminate this first stage of penguin evolution. 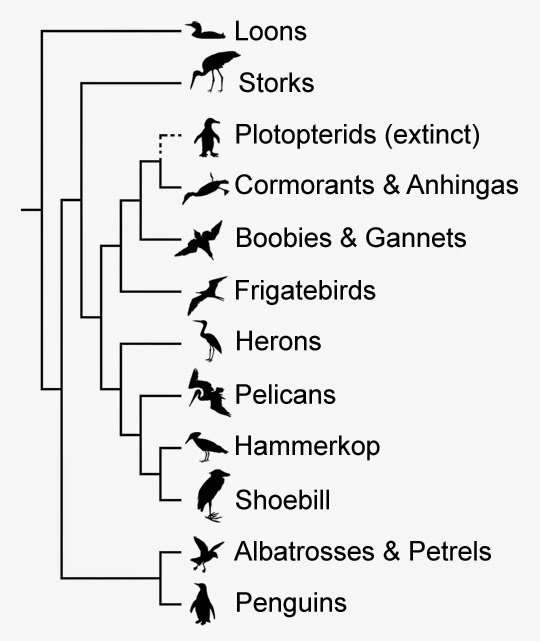 Evolutionary tree showing the relationships of penguins to other waterbirds. Fossil penguins appear on the stage in the Paleocene Epoch, the first phase of Earth history following the mass extinction that killed off the non-avian dinosaurs. These fossils turn up not in Antarctica as some might expect, but in New Zealand. This is appropriate enough, as New Zealand is one of the hotspots of modern penguin diversity. The oldest penguin fossils that have been reported so far date to about 61 million years in age. They belong to a species called Waimanu manneringi, (a name derived from the Maori word for “water bird” and the name of Al Mannering, discoverer of the fossil). A smaller species named Waimanu tuatahi lived around the same time. Within a few million years, more species started turning up and New Zealand became a penguin paradise. Almost completely devoid of mammals, the region was a perfect breeding ground for birds that seek to evade land predators. Life reconstruction of the early penguin Waimanu tuatahi. 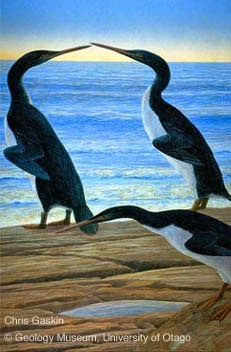 Artwork by Chris Gaskin, © Geology Museum, University of Otago. Among the species that once swam the waters surrounding New Zealand were Kairuku waitaki and Kairuku grebneffi. 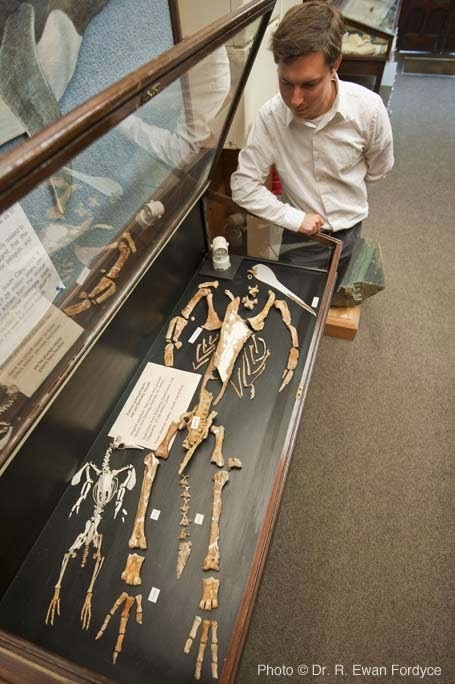 Kairuku translates roughly to “diver who returns with food”, whereas waitaki references the region where the fossils were found and grebneffi honors Andrew Grebneff, who contributed to the collection and preparation of the fossils. These penguins would indeed have returned with great stores of food, as they were giants. Reaching heights more than a foot taller than living Emperor Penguins, Kairuku penguins would have cut regal figures on the ancient beaches. They were not alone, but lived alongside several smaller species, such as the roughly two foot tall Duntroonornis parvus. New Zealand has continued to host many penguins species through to the present, and today it is possible to find breeding Little Blue Penguins (Eudyptula minor), Yellow-eyed Penguins (Megadyptes antipodes), and Fiordland Crested Penguins (Eudyptes pachyrhynchus) on the mainland, as well as several other species of crested penguin on the outlying islands. From their New Zealand stronghold, penguins were about to break loose. We'll watch the start of this expansion unfold in the next post. By request of my image providers, the standard conditions are: one time single use, with no transfer of copyright.